This is, in many ways, a typical and unremarkable September weekend filled with some mid-tier, perfectly acceptable films. But in one big way, it's remarkable for the fact that it isn't remarkable enough. This is led by the fact that our top new film is American Made, a film starring the once Biggest Star In The Universe, Tom Cruise. It's launching at the end of what's normally the slowest month of the year and getting kind of a slow roll release. We're truly in new territory when a Cruise film is basically dumped on the market, and even weirder since it appears to actually be, you know, good. Cruise stars as the real-life Barry Seal, a former commercial pilot who after being caught smuggling cocaine, is hired by the CIA to turn pro in order to help them fund anti-communist efforts in Central America. inadvertently starting the Medellin cartel, as well as kicking off the Iran-Contra scandal. Naturally, this is something of a comedy. 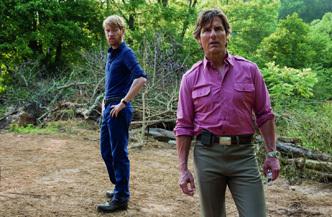 Directed by Doug Liman, it's got Cruise at his most manic and displaying a much different side, of the lovable loser, than we're used to seeing from him (and also about 20 years younger). It follows him around through a decade of “maybe it happened, maybe there's some delusions of grandeur” events, which definitely cast some shade on the Reagan '80s and the political adventurism that was the highlight of US foreign policy in those days. It feels like a close cousin to the recent War Dogs, a movie about two young Americans in over their head in the international arms trade, but then that was Jonah Hill and Miles Teller, and not a guy who's usually in blockbusters. In the wake of this summer's The Mummy, also an odd choice for Cruise, perhaps we're seeing a new avenue for an actor who's struggling to stay relevant. Reviews are actually pretty solid, but ad support for the film is fairly weak and the political subject matter is often a tough sell at the box office without a ton of awards support, which this isn't going to get. I'd expect about $12 million here this weekend. Adding to the weirdness of this weekend is the remake of a '90s “classic,” Flatliners, which has to be at least in the top, oh, 1000 films that people might want to see remade. Basically following the script of the origin to a T, just more Extreme!, it follows a group of medical students who discover that a medically induced death for a few minutes brings about mental super powers... and then maybe insanity, or maybe something coming back with them? Where before this starred Julia Roberts, Kevin Bacon and Kiefer Sutherland (and Billy Baldwin! ), this version has Ellen Page, Diego Luna and Nina Dobrev as its notable stars (and a return by Sutherland, meaning this is really a sequel... sure why not). Directed by Niels Oplev, who helmed the original Swedish versions of the Dragon Tattoo movies, it's a film that's ultimately struggling for a reason to exist. It's an attractive cast, but not one with any great drawing power, and the subject matter seems a little silly – too much of a thriller for horror fans, too much of a horror film for thriller fans. I'd expect just $8 million or so here. Opening in National release, Battle of the Sexes is coming in with some awards buzz. A theatrical version of the famous tennis match between Billie Jean King and Bobby Riggs (there have been TV versions before), it stars Emma Stone and Steve Carell in a movie about the struggle for women's equality in the '70s. Riggs, a former tennis champ and degenerate gambler, cooked up the scheme to play King in a male vs female championship bout as a bid just to create publicity for himself and to make a quick buck. It quickly turned into a flashpoint for the burgeoning women's lib movement and had ramifications well beyond just a tennis match in popular culture. What makes this an interesting enough story for a movie is the characters behind this – Riggs, at 55 when the match was played, was a bit of a hustler and searching for relevance, while King, who was at the top of her game, was also dealing with awakening sexuality and in the beginning of a secret relationship with her secretary. Featuring winning performances from its two leads, this is something to watch as it potentially expands, but should open to about $4 million on around 1,200 screens this weekend. So that means Kingsman: The Golden Circle gets a second weekend at the top spot after debuting with $39 million, just a shade higher than its original film. That's a good news/bad news situation, as it justified the sequel but didn't grow the audience, and will have to hope for some strong international numbers for its brand of over-the-top stylish violence to be profitable. I'd expect a second weekend of about $19 million. Meanwhile, the phenomenon that is It cracked $500 million worldwide this week, and is headed well north of $300 million to become the highest grossing horror film of all time (OK, OK, inflation). Never overlook the power of creepy-as-hell clowns. Give it about $13 million this frame. Lastly we have The LEGO Ninjago Movie, which missed the mark at $20 million and proves that Warner Bros. should probably slow its roll on these toy tie-in movies, or at least save them for properties that have a certain amount of recognition. This idea proved too kiddie, where the original was the Toy Story of its style, and Batman was, well, Batman. It's not a disaster, but its $13 million this weekend doesn't bode greatly for continued spin-offs.